On 15 May 2017, Welcome Break announced their latest new brand, PizzaExpress. PizzaExpress is a popular Italian food chain which serves pizza and pasta. They have locations in most large towns. In October 2017 the first motorway restaurant opened in a new building next to Oxford, and in June 2018 one opened at South Mimms. 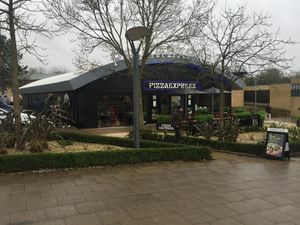 The new Fleet had a large PizzaExpress built into it when it opened in September 2018, and Beaconsfield followed in December 2018. Cobham is the latest opening in March 2019. Takeaway pizza restaurants have previously struggled to conquer the motorway network, despite recent efforts from Pizza Hut Express, Domino's 2Go and Welcome Break's own attempt with Papa John's Pizza. This time, Welcome Break are aiming for the family-dining market which has also attracted the likes of Harvester to the motorways. Welcome Break had suggested it will be coming to 10-18 of their sites. It's not clear which of these will require new buildings, as their current building design doesn't leave a lot of room for long-form dining.